It’s little wonder that Darlingside’s quad-vocal acoustic loveliness has had glowing reviews back home in Massachusetts, with critics comparing them to the legendary likes of Crosby Stills, Nash & Young and Simon & Garfunkel. Even though their sound is heavily informed by these godfathers of acoustic music, Darlingside are much more than just hippy throwbacks. Amid the bliss of the mandolin, banjo, lush acoustic guitars and strings, more contemporary heavyweights Iron & Wine, Fleet Foxes and Nickel Creek are all brought to mind as well. Birds Say gets a UK release on July 15th (the band already having released an EP and debut album Pilot Machines in the US) and they will be playing a short UK tour at the end of this month starting with a slot at the Cambridge Folk festival. 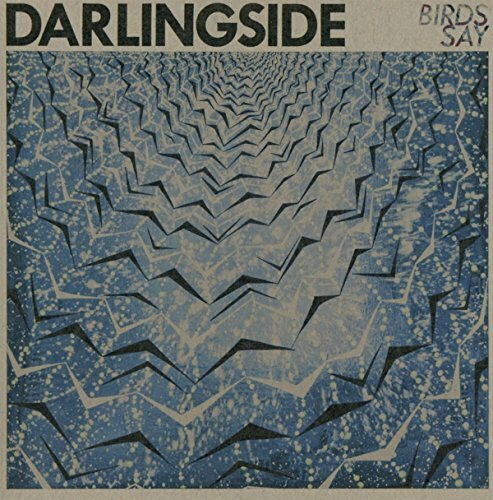 Darlingside have honed their craft carefully over the years (they’ve been friends for a decade) and, on Birds Say, have opted for an almost purely organic sound, with minimal electric instrumentation. No conventional ‘kit’ drums or percussion (not even so much as a tambourine – it’s madness surely?!) are to be heard on the entire record. This is a brave move and helps to distil their sound, as the exquisite four part harmonies are able to come to the fore and the quartet’s formidable instrumental talents are laid bare, with no crash and jangle to hide behind. It also gives the album the sound of portability, as if the band could just pitch up anywhere and do their thing. The album opens with the chugging bass and strings of ‘The Ancestor’, a perpetually building song about finding a brighter future in the younger generation. ‘White Horses’ starts really gently with rolling banjo, percussive guitar and hushed harmonies, but there’s a gradual crescendo and the full wash of the four-part vocal is felt for the first time. Lovely. The surreal stream-of-consciousness dreamscape of ‘Harrison Ford’ shows a more bouncy and playful side to the band: think Kings of Convenience with a healthy dash of Penguin Café Orchestra in the middle. It serves as some light relief before the record moves on to more tangible subjects, with the gentle waltz of ‘Clay & Cast Iron’ which brings to mind the fantastic Fionn Regan at his understated best. The band tackle the concept of time-as-prison in ‘Go Back’ which, again, showcases the sheer beauty of the unencumbered vocals. The song’s repeated refrain of “I know I’m no doctor but I know/You can’t live in the past/But the only way to go is to go back” seems to sum up the album’s entire ethos and explicitly lays out the tensions of a modern, forward-thinking band whose sound is rooted in the musical traditions of the past. Darlingside put their biggest gem right in the middle of the album: ‘My Gal, My Guy’ is Simon & Garfunkel for the metrosexual age, mixing big-city imagery with the euphoric dreamstates of being head-over-heels in love. With a chorus the Eagles would be rightly proud of; this song deserves to be a huge hit. The intimate title track ‘Birds Say’ is next up and, by contrast, the song seems small and unassuming, featuring delicately picked guitars, hand-claps and boxy strings. It feeds in nicely to the heartbreaking ‘God Of Loss’ which, again, starts gently with yearning strings but unravels into a sprawling song of mourning the past while defiantly starting over in a new place. The most daring track on offer comes in the form of ‘Do You Ever Live?’ its studio trickery providing an atmospheric bed beneath the undulating, unpredictable and (all of a sudden) unconventional harmonies. It’s essentially Taxiride and The Thorns gone prog. In a good way - remember: prog isn’t a swear word. It all gets more conventional with ‘She’s All Around’ and ‘Volcano Sky’ which both allow solo voices to take the verses. The two songs are downbeat, brooding and tender and therefore seem to be something of a piece. The former is a celebration of nature and the seasons and the latter charts the search for solitude in a noisy world; its narrator longing to take flight above the earth, just to get some perspective. The relative simplicity of ‘Good For You’ is a welcome contrast and as the record ends you have the firm sense that what you’ve just heard is little short of a modern classic. Darlingside are smart enough to know that it’s not enough to just be retro; it’s not enough to just be cool and it’s not enough to just be a master of your voice and instrument. You need to do all of this and more. Darlingside have stories to tell, mysteries to solve and journeys to take us on. Birds Say manages the impossible; it is humble and bold; it is familiar and strange; it is slick and fragile. It is, in short, a total delight.